Earlier this week, North Korean leader Kim Jong-Un visited an indoor mushroom farm and called for the country to become a world-class mushroom producer. A mushroom kingdom, if you will. "The mushroom cultivation grounds look very nice and I am pleased to see them," said the Supreme Commander (via NKLW), who added that it was necessary to follow the wishes of late President Kim Il-Sung, the country's founder, and turn North Korea into a "world famous mushroom producer". 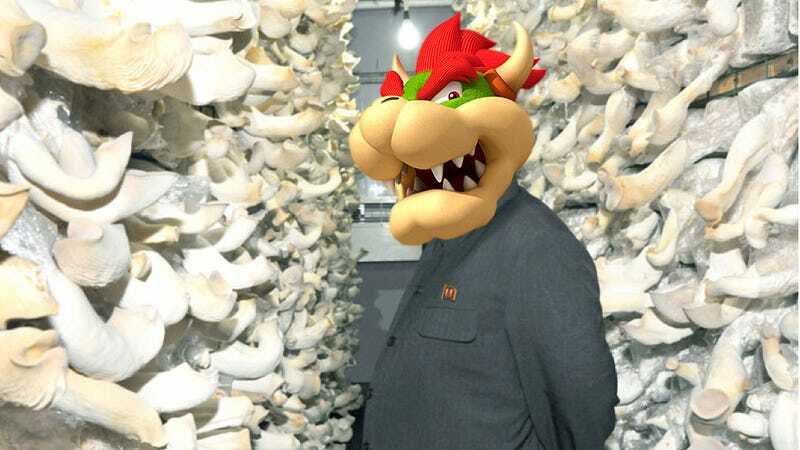 This is Kim Jong-Un outside the mushroom farm. I don't think he's being held back from going at the fungi. While that certainly sounds like a good idea (especially considering the country's famines), online in Japan, people seemed amused by the idea of North Korea turning into a "mushroom country". "What is this, Mario Brothers?" asked on commenter on 2ch, Japan's largest forum. "The Mushroom Kingdom has arrived," said another commenter on Hachima, a popular Japanese game blog. There, there were those simply amused by seeing a smiling Kim Jong-Un surrounded by mushrooms. Good thing they don't look like dicks, huh?